Sleigh the neighbours this Christmas with an outdoor display that wows! 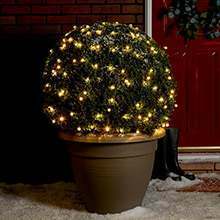 It has become increasingly popular to use outdoor Christmas lights on the front of the house and in the garden, as well as on outdoor Christmas trees when decorating exteriors for the festive season. Especially popular are outdoor Christmas figures. They are simple and easy to install, with mains-powered and battery options available, and all our outdoor Christmas lighting is available in a huge range of colours and styles. Bulbs are included & fixed in place. 1 x high quality 60mm LED festoon bulb. Durable metal tipped E27 base. Durable plastic tipped B22 base. 192 LEDs per 5 metre length. The human desire to light up their houses and gardens over the festive season could well be instinctive, stemming from the first caveman to create fire. And the tradition has been going for almost as long (please note: this is not historically or factually accurate). 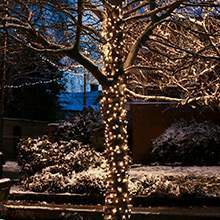 Whether it's a National Lampoon's Christmas Vacation, Griswold family, over the top style Christmas display, or a more modest affair, there are outdoor Christmas lights to suit. 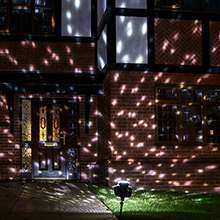 From cluster lights around the window, to icicle lights running along the guttering, there is an array of different outdoor lights available to really create the winter wonderland you've been dreaming of. And, if you really want to go to tinsel town, add a host of Christmas figures to light up your lawn too! 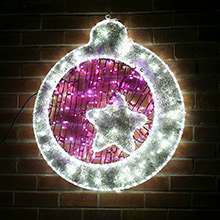 Illuminate up your home with our wide range selection of outdoor Christmas lights. We have all your Christmas lighting essentials right here. Our high-quality range of Christmas lights and displays, make your home the seasonal wow factor it deserves. From Christmas Santas to reindeer to penguins, there’s something for everyone to enjoy. Our displays really lighten and power up your home, packing high-powered LEDs and showcasing a wonderful multicoloured exhibition. Our wide range includes icicle lights, silhouettes, laser projectors, tree lights, festoon lights and fairy lights. 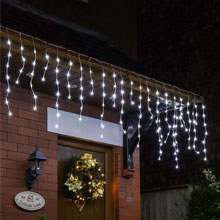 Check out our twinkle range of Christmas LEDs, all three of our Santa, Reindeer and Snowman twinkle LED lights are 1.1m in size and include a real uplifting festive mood towards your home. They’re suitable for indoor and outdoor use and are super easy to set up and install. Invite into your garden and outdoor space our connectable LED lights range. 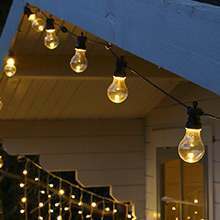 Be creative and hang up your fairy lights surrounding an area of your garden. This will really bring forward a warm atmosphere and deliver Christmas spirits across your family and home. *By signing up you consent to receive emails based upon your interests, existing purchases and location. You can unsubscribe at any time.